Mainland Eagles Alumni Sam Smith is in his first season at Texas Wesleyan after two seasons at Brown Mackie College. Texas Wesleyan are the defending NAIA champions and were ranked the number 1 team in the preseason NAIA basketball rankings. Sam originally from Tauranga where he attended Tauranga Boys before moving to Christchurch and training with the Mainland Eagles. Last season at Brown Mackie Sam averaged 11 points, 7 rebounds and 4 assists a game while shooting 40% from 3. Sam played 32 games and started all 32 games. Sam has continued his efficient start at Texas Wesleyan so far averaging 9.8 points, 4.7 rebounds and 2.3 assists in 29 minutes a game. 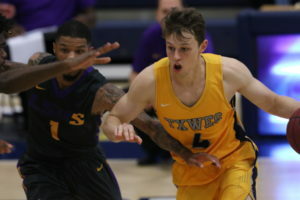 Yesterday Sam had his best performance for Texas Wesleyan scoring 16 points to go with 8 rebounds and 2 assists in 38 minutes. Unfortunately the team went down 81-90 to Panhandle State. 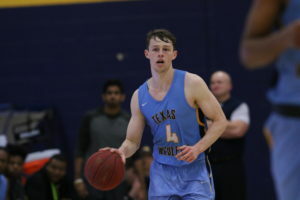 Mainland Eagles reporter Isaiah Smiler recently caught up with Sam, to see how his year at Texas Wesleyan College has started. How are you enjoying Texas Wesleyan? I’m really enjoying Texas Wesleyan. It’s a small school, but it’s a fun place to be. What degree are you doing? I’m doing a B.A.A.S. in Interdisciplinary Studies, focusing on accounting and finance. Its a little different, but it will allow me to graduate on time compared to a normal business degree. What was the biggest adjustment you’ve had to make in the classroom? There haven’t been any significant adjustments for me. I was at a junior college last year, so class is pretty similar. The only difference is that my schedule is busier. What’s the biggest thing you learnt at the Mainland Eagles academy, that’s stuck with you throughout your time at college? Always competing, so whether it’s at open gym, practice, or a game day shoot around. How did the Mainland Eagles help you individually, as a player and a college student? Being prepared to workout, practice, or study everyday. You rarely get days off, and it can be difficult to always stay engaged. Eagles somewhat simulates what it can be like at college, and it helped be more ready when I arrived here. What would be the biggest piece of advice you would give to players wanting to get over to play college basketball? Be prepared, no matter school you go to or what level you play at it will be tough and nothing will come easy. What’s been the most enjoyable thing about being at college so far? I don’t know if it’s the most enjoyable thing, but winning road games would be up there. Going into someone else’s gym and stealing a win is a pretty good feeling. Keep up to date with Sam and his Texas Wesleyan teams by reading the Eagles Express articles which come out each week at the following link. 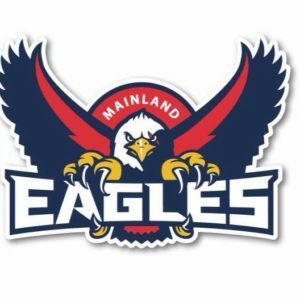 The Mainland Eagles Academy was established in 2014 by the Canterbury Regional Basketball Foundation to support male and female players throughout the South Island to pursue their dream of pursuing tertiary education & basketball excellence both in New Zealand and the United States. Keep up to date with updates on past and present Eagles athletes on our Facebook, YouTube and twitter.